In the aftermath of a natural disaster, communication is crucial and mobile networks go into overdrive as emergency services and aid agencies get to work. During this time, survivors desperate to connect with family find themselves competing for telephone or internet networks. Facebook has developed a service that may relieve some of the stress in times of crisis – the Safety Check. When Facebook users are in the vicinity of a natural disaster or emergency situation, Facebook sends them a simple message asking them if they are OK. In one easy click, people can let their entire friend list know that they are fine, or that they are not in the affected area. Rather than clog up networks with phone call after phone call to friends and family, people can allay all of their loved ones’ worries in one go. Friends can update loved ones’ safety statuses too, if the person in question is unable to get online but has managed to get a message through. The service also shows users a list of all their friends suspected to be in the disaster zone, and notifies them as each friend confirms they are safe. The Safety Check feature was first developed in Japan following the earthquake and tsunami there in 2011, and was officially launched in October 2014. Its first significant deployment was in April 2015 during the crisis in Nepal after a magnitude 8 earthquake and its strong, continued aftershocks killed over 9,000 people and injured 23,000. 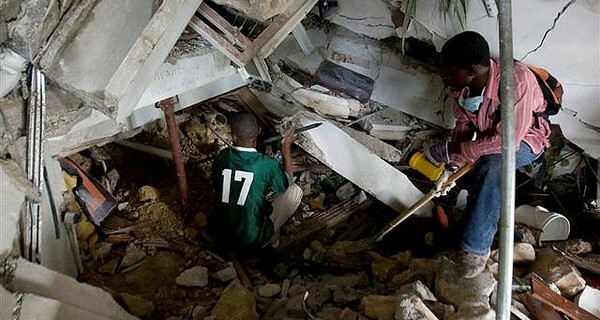 Image 'Haiti Earthquake' courtesy of United Nations Development Programme.